I kind of dread the first one of these that shows up in my inbox every year because it really drives home the point that summer is over and short, dark, soggy days are coming. 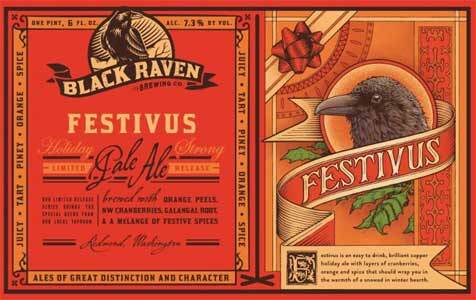 This Friday, October 6th Black Raven Brewing releases the 2017 version of Festivus, its annual holiday beer. Holiday beer, winter seasonal beer, whatever you call it, you cannot ignore the inevitable descent into darkness. Indeed, we are quickly slipping into the gloom. As we all enjoy fresh hop beers, that last beery glimpse of summer in a glass, it’s hard to ignore the inevitable fact that the winter is coming. In the blink of an eye, Thanksgiving will arrive and the holiday season will be in full swing. Short, dark days are ahead. Sloppy, wet, cold nights. Seasonal Affective Disorder. Christmas shopping. Sorry, I don’t mean to bring you down, but Black Raven started it. Luckily, we have winter seasonal brews to help combat the wintertime blues. How else would we survive?